A sentry captures the occurrence of a certain event occurring or a condition being fulfilled within a case. Sentries are used as entry and exit criteria. Note that the black and white diamonds represent the criteria. A sentry itself has no graphical representation. The above example defines a sentry that is fulfilled when the plan item PlanItem_HumanTask_1 performs the state transition complete (note the planItemOnPart element) and a variable named myVar has a value greater than 100 (note the ifPart element). Furthermore, it serves as an entry criterion for the plan item PlanItem_HumanTask_2 that becomes ENABLED as soon as the sentry is fulfilled (note the entryCriterion child element of the element PlanItem_HumanTask_2). OnPart: A trigger that occurs when a certain transition in the lifecycle of a plan item or a case file item is performed. IfPart: A condition that is checked when all OnParts are fulfilled. This condition is defined on case data. A planItemOnPart must always reference a plan item by the attribute sourceRef. This plan item must be contained by the same stage the sentry is defined in. The child element standardEvent can the identifier of any lifecycle transition from that plan item’s lifecycle and that is supported by the camunda engine. Note that different plan item definitions define different lifecycles. For details on valid lifecycle transitions, see the Lifecycles section. As an alternative to sourceRef, the CMMN specification allows to define an attribute sentryRef responsible for referencing another sentry such that the onPart is fulfilled when the plan item that sentry references performs the exit state transition. This attribute is currently not supported by the Camunda engine. Note that it is possible to have any number of OnParts which allows to combine multiple events. All OnParts must be fulfilled for a sentry to occur, i.e., specifying multiple OnParts is a conjunction of multiple events. An OnPart is fulfilled as soon as the element it is defined on performs the specified lifecycle transition. It is irrelevant whether this element performs any other subsequent lifecycle transitions. A sentry can have at most one IfPart and that IfPart can have at most one condition element. In the condition element, expression language must be used. In such an expression, case variables can be accessed by their name. The above example defines a condition that evaluates to true if there is a variable named myVar and that variable’s value is greater than 100. The CMMN specification allows to reference a case file item by the sentry attribute contextRef. This attribute is not supported by the Camunda engine and therefore ignored. The engine evaluates IfParts at every lifecycle transition of a plan item contained in the sentry’s stage. That means, if an IfPart is not satisfied immediately when all OnParts have occurred, the sentry may still occur at any later lifecycle transition. In the above example, sentry is evaluated when the create event on the variable variable_1 occurs. variableName and variableEvent defined in the variableOnPart of the sentry matches the occurred variable event and the associated variable name. Consider the below example in which there are two human tasks. 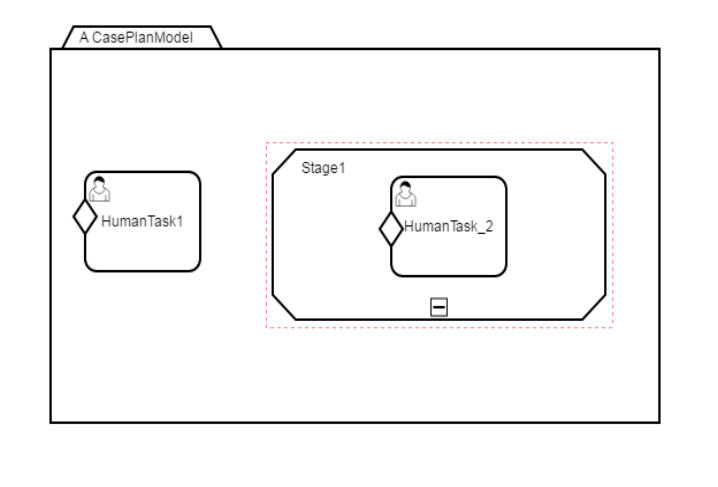 HumanTask1 is defined inside the case model and the HumanTask_2 is defined inside the stage. Each human task is attached with a entry criterion sentry and both the sentries are evaluated when the update event for the variable foo occurs. When a variable foo is set and updated in the scope of the case model, then both the sentries are evaluated and results in the transition of HumanTask1 and HumanTask_2 from available state to enabled state. When there exists two variables of the same name foo, one defined in the scope of the case model and the other defined in the scope of stage. Then, sentries are triggered based on the scope of the update event. When the variable foo is updated in the scope of the case model, then only the HumanTask1 gets enabled. When the variable foo is updated in the scope of the stage, then only the HumanTask_2 gets enabled. Sentries allow a flexible definition of event occurrences and data-based conditions to be fulfilled. The following rules apply for combining OnParts, IfParts and VariableOnParts. A valid sentry must have at least one of the sentry parts (OnPart or IfPart or VariableOnPart). A sentry without OnParts is fulfilled when the IfPart evaluates to true and all the VariableOnParts have occurred. A sentry without an IfPart is fulfilled when all OnParts and all the VariableOnParts have occurred. A sentry without variableOnPart is fullfilled when all the OnParts and IfPart are fulfilled.